The “you must have at least this long a beard to brew beer” jokes land because everyone -- even people who aren’t craft beer drinkers--understands the underlying premise: Craft beer drinkers are white, male, straight, and preferably flannel-clad. Is this still true in 2018? Are craft beer drinkers actually more diverse than the industry realizes, but the optics just haven’t caught up? Or does craft beer really suffer from systemic homogeneity that it will have to actively confront if it wants to rid itself of the cliche? 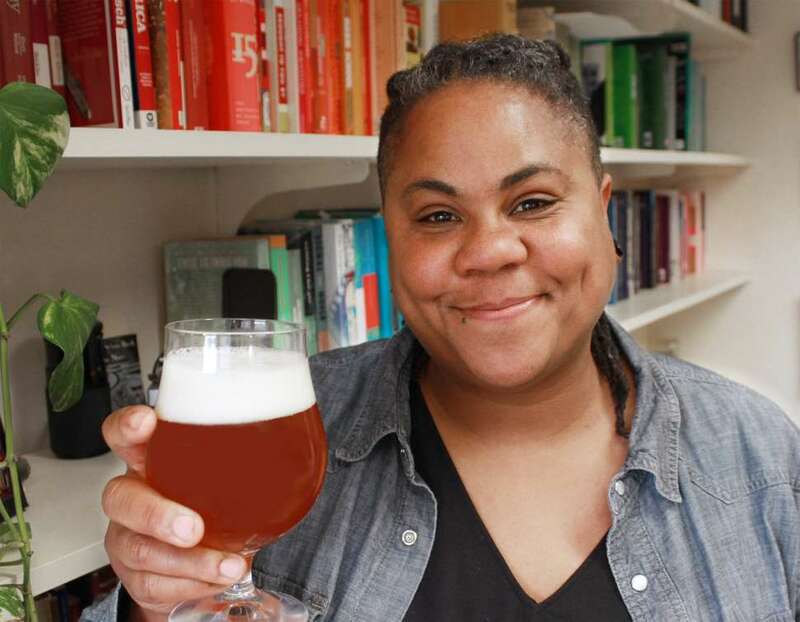 Whether it’s both, one, or neither, there’s a new face who’s tasked with finding out: Dr. J. Nikol Jackson-Beckham, the first ever Diversity Ambassador for the craft beer trade group Brewers Association. Jackson-Beckham is an assistant professor of communication studies at Randolph College in Lynchburg, Virginia, a longtime homebrewer, and a craft beer researcher. Jackson-Beckham stepped into the newly created role in April to cheers from within the beer industry, and addressed the largest craft beer industry conference, Craft Brewers Conference, in May. I spoke with her a couple days after CBC to find out what she hopes to accomplish in her new role; what diversity and inclusion look like in the beer world; and what to do with those critical of her mission. What is your goal in this role? I think it’s fair to say first that the diversity committee and myself have yet to set very specific goals. Right now, we really are focusing on one large goal and that is listening to the membership. Definitely what I’m investing most of my time and energy in is just hearing. In many ways, the charge or even the request or opportunity to pursue more diversity and inclusion in an organization... isn’t one that’s often accompanied by a sustained effort. It tends to be: Fix it. Personally, one of the goals in the front of my mind is to get people to rethink what they assume or perhaps what they’ve heard before about the word “diversity.” There’s some challenges there, but I think it’s useful to pivot a little bit and rethink: What do we mean when we say this word? What do we mean when we say "diversity?" I think on a broad level, one of the first words that comes to mind for a lot of folks is "problem." Even since the announcement [of my role] has been made, there’s lots of folks who have reached out -- folks in different trade media -- who say, "What are the problems?" And one of my responses is that I really don’t want to think of this as a problem. That’s not to say there’s not problematic aspects. When you cast this as a problem, you start saying, "Whose fault is it?" It’s not very useful to look for fault, to see whose problem it is. Instead, I want to think: What are our opportunities here? Then you realize, gosh there’s a lot of efforts we can make, and people are really open to collaborating on opportunities rather than problems. At Craft Brewers Conference you said, "We all want to diversify craft beer." Is that true, or are some people invested in this being the old boys' club? As I was doing some last minute editing [to my presentation] before the talk, I edited out a couple lines where I was going to say, “Well, this isn’t true.” Because I was like, “I’m going to come out on a positive leg.” In a previous iteration [of the presentation], I talked to the North Carolina Brewers Guild last November, and when I spoke to them, I did say that. I did say “This isn’t true.” In some sense, though, I think we have to be OK with that. And it doesn’t mean we can’t want better or can’t hope for better. When you cast this as a problem you start saying, "Whose fault is it?" It's not very useful. At least for me, a person who advocates for diversity and inclusion not just for the BA, but in my job as a college professor and in my social life, we can’t spend so much resource worrying about those who are not inclined to make that choice. Particularly in my role in the BA, it’s my job to provide tools and resources for those who want them. Is the work of diversity in beer all on breweries, or what can the individual beer drinker do to make the community more inclusive? In my personal experience, consumers are already quite good at this, as far as opening the door to kind of authentically bond with someone around a common piece of interest. It’s one of the things that’s always drawn me to craft beer and made me feel comfortable in this community: If I sit down at a bar next to someone I’d rarely have occasion to socialize with, you start talking with: Well, what are you drinking? The natural sense of curiosity and the natural desire to compare and chat and debrief that comes from craft beer, it does that. That’s not to say there aren’t ways that people end up erecting barriers between themselves and other people -- the cult of expertise is one of those walls in the craft beer world: How much do I know, how much have I tasted? Again, I think, those are matters of choice for an individual drinker and I may have a personal desire to say "I wish you wouldn’t do that" but I don’t think it’s necessarily my place to say, "Hey, cut it out." But I also feel like it’s a cool thing to instead say, "Look how much fun it is when we’re all at the same table." What's the big diversity topic that beer isn't addressing? Again, this is one of the things I really want to hear more from brewers. I would be loathe to try to answer it on my own; I want to hear what they have to say. There are a lot of things that throw really distracting optics, like packaging art. If you were just watching Twitter or some of the conversations that go on about sexist labels, you’d assume the industry has this massive problem. But looking at the numbers, this is a small number of people making decisions not representative of the community as a whole. These kinds of optics can be deceiving. Anecdotally, the question I’ve been asked most about comes from labor force. Brewers saying, "We really want to diversify our taproom or our staff, and how do we build our pipeline of qualified candidates?" That’s probably going to prove to be one of the most challenging things to address. Thrillist published a James Beard Award-winning piece in 2015 called, in part, "There are almost no black people brewing craft beer." Do you agree with that statement? I think then it struck me as a little bit of a clickbait title, but I also think that it was a characterization that maybe is difficult to argue with. By the numbers, if you’re thinking of ownership and brewing staff, is that particular demographic comparable to the demographic distribution in the country as a whole? Probably not. So in that sense, right, I’m like, OK yeah. But I think though it’s probably not intended and maybe [the author] Dave [Infante] would argue with me here, but I don’t know that [the title] was meant to be strictly demographic or numerical. I think he was arguing something broader... that there is a bit of a glass ceiling for people of color, or something else is happening. If you’re reading it that way, then I actually feel like I don’t know if a tremendous amount of that has changed, but the climate has shifted since 2015. I know there have been more owners and brewers coming in who are people of color, but I think there’s been more people who are thinking about visibility for different populations in craft beer and taking steps. Is there a lack of participation or a lack of representation of those people in the narrative of beer? I think a little bit of both is happening. At CBC, there was a moment where it was kind of after I was done with the seminar, during the Q&A, a young woman who stood up and said she’d been the manager of a taproom for three years -- she’s a woman of color -- and she’s talking about instances where the customer had a question or a vendor was delivering something that immediately they’d be looking for someone else to talk to, thinking, "Who’s in charge? Clearly not you." ... While this person was talking, there are people all over the crowd nodding like "Yep, yep, right. I’m having similar experiences." There’s still just some unconscious bias operating: "Who is expert in this community? Who is most legitimate?" But I do also think there is an exposure opportunity here too. I did a little bit of academic writing a couple years back about why people of color particularly African-Americans may have a little bit of aversion to beer in general. Because in a lot of ways, 40 ounces have been stigmatized, and so you see a lot of African-Americans turn to premium liquor rather than craft beer. The cool thing is there’s just a lot of lifestyle brands and advocacy groups operating around the fringes of craft beer right specifically taking up the challenge of just introducing beer to communities who haven’t been in it. One of the things I’d love to do in this role is reach out to some of those groups and see if there’s opportunities to connect them to breweries in their areas, hear their voices, think about their ideas. How does a homebrew club or a beer group move toward inclusion without falling into tokenism? It’s, to be 100% honest, something I hadn’t given a ton of thought. I have seen more and more homebrew groups wholly composed of groups of people who generally haven’t been active in the homebrewing community in general. I think it’s great as far as people getting to the hobby. But I certainly hope it doesn’t stop there. If that’s the way clubs will organically compose themselves, I’d love to see them all come together and share voices. I'm not the diversity police. I'm the diversity ambassador. But again, I’m a homebrewer as well, I’ve been in a homebrew group about 10 years. I also think this is a community that’s really good at getting past initial assumptions very quickly. Initial assumptions exist, this is kind of what we do as human creatures, but once you start talking about homebrewing or the mechanics of homebrewing or what’s in your fermenter, you just start speaking a common language. This is why it’s really easy to get squishy and esoteric when you start talking about beer because it seems to be able to operate that way. What do you hope the beer world looks like in 10 years, from a diversity perspective or otherwise? One thing that came up at CBC a lot that I’ve been a strong champion of is understanding that success does not always equal exponential growth. I can be a successful brewery that stays just this big and operates very sustainably. I’m most interested in that because I think breweries that do this very well tend to really have an interesting and close connection to the communities in which they’re embedded. Extending that thought, if we have this model of successful sustainable independent business that reflects the communities in which they’re embedded, then to me that’s also a way to think about opportunities to diversify and include, that might also be that breweries reflect their communities. Maybe it’s that simple. What would you like people to know that I haven't asked you about? I’m just excited to hear what people have to say and get to work. The understanding that both I and the BA have is that this is not going to be a short process, that we really have to dig in and maybe make a bunch of attempts and it’s going to be a process. If we can successfully take that first step to get people to rethink, "What does it mean when we talk about diversity in this industry?" If we can effectively say "this is not about slapping your hand or scolding you." I was jokingly talking with some folks... they were talking to me about some beer labels and "the label question," asking me, what do I think? And I’m like, "I’m not the diversity police, I’m the diversity ambassador."